People who believe in the maxim that 'Prevention is better than cure', try their best to keep away from this distressing disease than regretting later for not doing so by becoming a victim. Gastroesophageal reflux disease or GERD has affected too many Americans and is going on unabated despite all the preventive measures being regularly published in premium dailies and displayed in various television channels. The worst part is that most people suffering from the disease aren't even aware that they are victims of GERD. This indeed is very sad, particularly now that people are more conscious of their health and well being. However, this is not the end of the world nor is the disease not preventable. But to prevent a disease and its manifestation, one must have some idea of how it affects and what are its symptoms. From its nomenclature which is appropriately termed acid reflux, it is apparent that two issues are primarily responsible for the disease to take effect - the Acid and the Reflux. Here the acid referred to means the stomach acid (Hydrochloric acid) and the reflux indicates the backflow of the acid. What really happens is that a small little valve or sphincter situated at the end of the tube (the esophagus) which carries all the food and beverages that we consume through our mouth to the stomach occasionally malfunctions. This makes a part of the acidic stomach contents to backflow or reflux into the esophagus, irritating its inner lining. As it climbs upper into the esophagus where the tube is most sensitive, it creates a burning sensation, popularly called "heartburn". A few occasional heartburns may be quite normal but when the frequency escalates, it becomes a sure sign of acid reflux or GERD. While repairing the sphincter is a difficult proposition, controlling the acid is not. Since acid secretion in the stomach is essential, excessive acid secretion aggravating acid reflux may be regulated to prevent the reflux. But how to control the acid secretion in the stomach can pose a difficult question. But looking at it dispassionately, it is as simple as the breeze. Discarding acidic fruits and vegetables like the tomato and it derivatives (tomato sauce, tomato ketchup, tomato soup, etc) as well as oranges and other citrus fruits, including their juices will solve the problem to a great extent. But merely discarding acidic fruits and vegetables will not solve acid reflux problem as certain food items like spicy or fatty food also induce higher acid secretion. Besides, certain types of meat and other food items also trigger acidity in many. In order to categorize which food item triggers a person, one has to go on experimenting through trial and error method to establish a list of items that should be discarded from his or her menu in order to prevent GERD for good. 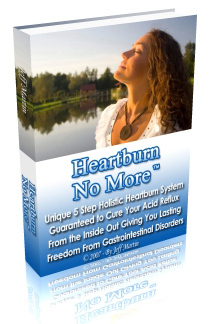 To prevent GERD, one may also reduce body weight since obesity is a prime factor for the spread of the reflux problem. Also important is to eat several smaller meals than having three major meals as the stomach has to work lesser, producing lesser acid to digest smaller meals. Going to bed immediately after a major meal may also ward off GERD for most people. So go ahead and do everything possible to prevent GERD. However this may not be possible always. When it goes out of hand, the problem needs to be treated, and the best way to do it is through holistic remedies, as they work better than conventional medications. There are many contributing factors of acid reflux and some of them are even genetic. Since holistic remedies treat the body as a whole, all these factors can be identified and treated, rather than just treating the symptoms of the ailment. If just the symptoms are treated without delving deeper into the real causes, then the symptoms tend to come back, even after they are gone with the initial treated. But this is not the case with holistic remedies, which is why they are so much more effective.